There is more information available on this subject at Holography on the English Wikipedia. "Hologram" redirects here. For the Armor ability, see Type-27 hologram. A holographic topographical map and the avatar of AI Serina aboard a UNSC warship, the Spirit of Fire. Holography is a technological system that forms a visual representation of an object in three physical dimensions, as opposed to the planar image of traditional screens that simulate depth through a number of different visual effects. Holography is employed by the humans, the Covenant and the Forerunners in a variety of functions - communications, battle and sensor displays, and as distractions and decoys. Devices used to project holograms are commonly referred to as holotanks. An example of civilian application of holography in Club Errera. The UNSC uses holographic technology in a variety of ways. Artificial intelligence constructs, such as Cortana, project holographic representations of themselves for personal communications with humans, with each AI taking a unique appearance of their own choice. The UNSC also uses holograms for communications between individual humans. The commanding officer of one ship may "appear" on another to deliver a message when normally access between the two vessels is restricted. Many UNSC warships, bases and other facilities are equipped with holographic tables, used to project topographical maps or other images for tactical purposes. Holography is frequently used in human computer terminals, which, though not actually solid, respond accordingly to physical input without the need for a separate device such as a keyboard. Holography also has many civilian uses. For example, some nightclubs such as Club Errera make extensive use of holograms. Humans also use holographic technology to display holographic "photographs", referred to as holo-stills. Holographic tape is used to display information on the sides of civilian vehicles. Covenant Prophets used holographic projectors to preach to their troops. The Covenant's holographic technology is also based primarily on that of the Forerunners, and though superior to UNSC technology it still pales in comparison. The Covenant use holograms for visual displays of space and ground combat, allowing a better general view of the action and better coordination. Holograms are also used as decoys, through devices known as holo-drones, able to generate their own shields and weapons to give the illusion of reality. One of these was used by the heretic leader Sesa 'Refumee before his death at the hands of the Arbiter. The Covenant also utilize less sophisticated holographic decoys in the field, a technology which has also been replicated by the UNSC. As shown by the ability of holo-drones to use weaponry, certain Covenant holograms are somehow capable of physically interacting with their environment. The Prophets, in particular, make extensive use of holography in their governance of the Covenant. Religious sermons, such as those by the Prophet of Truth and Prophet of Regret, are transmitted holographically via portable projectors, allowing the Prophets to preach from the relative safety of their point of transmission while protected by armed guards. A Forerunner holographic representation of the Ark. Consistent with their high level of technological advancement, the long-vanished Forerunners were true masters of holography. Their projections were accurate far beyond UNSC or even Covenant capabilities, able to appear indistinguishable from physical objects and simulate solidity via the use of sophisticated hard light technology. 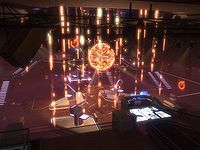 On the various facilities of the Halo Array as well as other Forerunner installations, holograms are used to convey information on the installation, from general visual representations to more specific details. Virtually all Forerunner control panels and terminals are based upon solid, hard light holography. The Forerunners also used their mastery of holography to produce realistic decoration to interior spaces; for example, the Forerunner ruins underneath CASTLE Base, despite eons of neglect, were still capable of projecting myriad environments from hundreds of worlds. What is generally, and incorrectly, referred to as a "hologram" in most science fiction, including the Halo series, is actually a volumetric display. True holograms are not three-dimensional images. More specifically, Halo "holograms" seem to be of the static volume type, creating an actual three-dimensional image rather than creating the illusion of it. A holographic map of the Silent Cartographer in Halo: Combat Evolved. A Forerunner holographic representation of Installation 04. A photorealistic hologram of Sesa 'Refumee produced by a holo-drone in Halo 2. A hologram of the High Prophet of Truth. A holographic representation of New Mombasa in Halo 3: ODST. A holographic sign showing the word "welcome" in different languages on the Quito Space Tether's orbital station. An enigmatic Forerunner hologram on Epitaph. A hologram of a UNSC frigate in the lobby of the Sinoviet Center in New Alexandria in Halo: Reach. Hologram of the UNSC Pillar of Autumn in Halo: Fall of Reach. Holograms in Installation 04's control room in Halo: Combat Evolved Anniversary. A hologram of the UNSC Infinity in The Commissioning. A holographic table in the Corbulo Academy of Military Science in Halo 4: Forward Unto Dawn. A holographic map of Requiem in Halo 4. Hologram of the UNSC Spirit of Fire in Halo: Escalation. Hologram of Installation 03 in Halo: Spartan Strike. The "dumb" AI Déjà using holograms to teach the SPARTAN-II candidates in Halo: The Fall of Reach - The Animated Series. Hologram of the ONI research vessel Argent Moon in Halo 5: Guardians. Hologram of Installation 00 aboard the UNSC Spirit of Fire in Halo Wars 2.